Believe or not, at one point in time in my life I taught nursing class. Of course, I was just a substitute at the time and knew nothing about nursing, but those students were much easier to handle than a roomful of kids that hated Algebra. You don’t have to hear the question “Why do we have to learn this?” day in and day out with nursing students. They tend to actually want to be there. So, I didn’t mind “teaching” nursing because the bar was set fairly low. It mostly involved me hitting the play button on the VCR, but I was pretty good at it. I’m surprised how much I actually remember from those health videos, though. Recently, I was thinking about a video on Maslow’s Hierarchy of Needs. 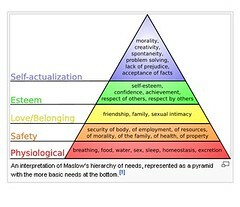 For those that never heard of Abraham Maslow, he was a psychologist that wrote about human motivation. Basically, he came up with a set of human needs and explained how we needed to fulfill one before moving up to the next need. You typically see it diagramed as a pyramid with our most basic physical needs at the bottom and self-actualization at the top. It got me thinking about how God always meets our needs. It is in Psalms 23:1 David says, “The LORD is my shepherd; I have all that I need.”, but what does it mean to have our needs met? Does that mean we get a house, good paying job, and spouse? Or does it mean we just get enough to squeak by in order to eat and everything else is a bonus? That’s where I begin to wonder if God is providing for our needs. I know many Christians that live their lives struggling to find a community, friends, or a spouse. If this is a need, why isn’t it met for these Christians. The next step in the pyramid is self esteem. So, those that get stuck looking for friends and community can have struggles with their self esteem. I think it could be a strong cause for depression in our society. It is rooted a simple lack of acceptance from the people we care about and as Christians we need to be aware of these people so we can give them our friendship. Makes sense to me. We all feel confident when we are respected and loved by people. Once that takes place, people look for self-actualization. The ability to reach their potential in whatever they desire. It may involve art, designing a building, or being a good parent. All in all, these things sound like things we do need. Then why don’t we have all of these things? Why doesn’t God give us these things all of the time if he is supposed to meeting our needs? Steven was the first martyr in the bible. He was a good Christian that helped spread the word of Jesus. He was blessed and preformed miracles in front of many people and spread the gospel. This angered the authorities and he was prosecuted for his ministry. When Stephen would not give in and stood strong in his faith, he was dragged into the streets and stoned. Being murdered by a crowd of people throwing rocks at you doesn’t seem to be God meeting your needs, but I don’t think that’s the way Stephen saw it. Instead Acts 7:59 says, “And while they were stoning Stephen, he prayed, Lord Jesus, receive and accept and welcome my spirit!” I think in that moment that Stephen’s every need was met even though he died. During Elijah’s lifetime God declared that it would not rain. This kind of left Elijah in a tough situation. He’s still human and Maslow is right, we need water before anything else. So, God sent Elijah to a brook and commanded the ravens to bring Elijah food. Elijah only received the most basic of needs to survive. He didn’t get any extra spending money, a good book to read, or friends to hang out with. God only sent the ravens to feed him because that was all Elijah needed at the time. On top of that, the brook eventually dried up, but Elijah lived on and continued to serve God. Maybe this is why Jesus refers to The Holy Spirit as living water. He is the thing we need more than anything else because our spiritual thirst must be quenched before our spirits can grow. And that is a brook that will never dry up. We will always have the opportunity to drink of God’s living water. There are many times in my life when I feel like my needs are not being met. When I can’t pay bills. When I can’t afford a place to live. When I can’t find a date. In these times I have to stop and remind myself that I only have anything because God gave it to me. I still have food to eat and a roof over my head. I’m not exactly Elijah, but I have an idea where he was coming from. Remember that we are all sinners. Essentially all of the struggles we face in this world is us receiving our just desserts. Focusing on what we need causes us to forget what we have. Like Maslow discovered, as humans we need things and sometimes we get caught up in the ones we don’t have. but even if you reach the top of that pyramid you’ll still need more because you’ll be missing Christ. Jesus doesn’t have a hierarchy of needs for us. To him there is no pyramid, but rather one circle with his love and salvation inside of it. When we accept that salvation, God provides for us with exactly what we need and gives it to us precisely when it is necessary. Sometimes that doesn’t line up with what we think we need, but remember what God has blessed you with and not what he has not blessed you with. It comes down to Philippians 4:19 “And my God shall supply all your need according to His riches in glory by Christ Jesus.” You see, God knows our needs better than we do. We can only see our with our worldly eyes and therefore only see our needs on this world, but God see our needs in the next life and he’s preparing you for it. Most days we need to step back and not see ourselves somewhere on the pyramid, but see our needs as God sees them. We were made to commune with God and he is making sure our needs at being met, but not so much on this world rather than the next life. So, look around and know your needs have been met.